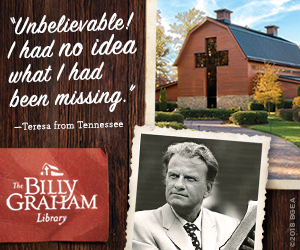 Did you know there are also artifacts from Billy Graham’s life at the Billy Graham Center in Wheaton, Illinois? One of the most interesting collections found there is the “Strange Things” collection. 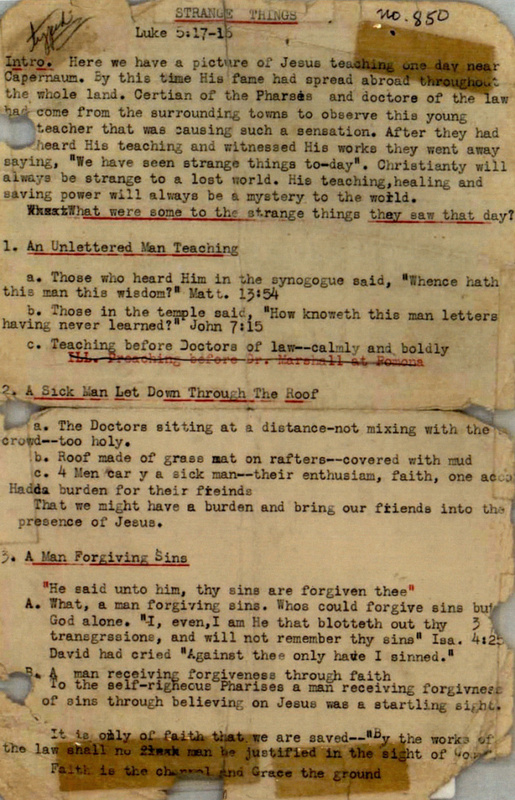 The entire sermon outline of “Strange Things,” dated November 5, 1941. Over its lifespan, the document has obviously been folded in half, stored in a three-ring binder, and taped down the middle to hold it open during preaching. When Graham arrived on the Wheaton College campus as a twenty-one-year-old freshman in 1941, he had already completed a thorough three-year course in Bible at Florida Bible Institute (now Trinity College). In addition to his coursework at FBI, Graham spent hundreds of hours preaching in churches across Florida and Georgia, held several multi-day evangelistic campaigns, and evangelized on street corners, over the radio, and from caravan to caravan in one of the country’s first trailer parks. In the fall of 1940, the Tab was pastored by V. Raymond Edman, a professor of history and acting interim president of Wheaton College. When asked to assume the presidency permanently, Edman resigned his role at the Tab and recommended Graham as his replacement. Already familiar with his preaching style, the congregation ratified Graham as their new pastor. 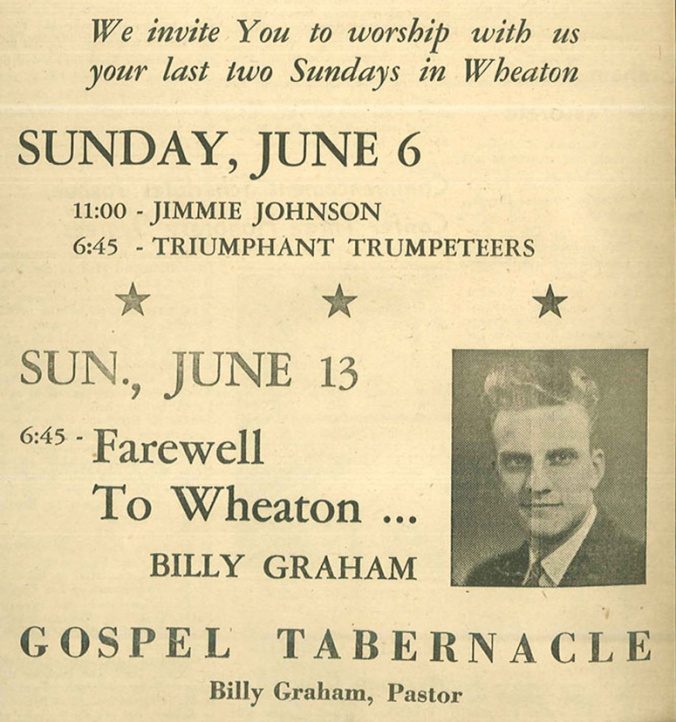 Between September 1941, when he became pastor, and June 1943, when he graduated from Wheaton College, Graham preached at the Tabernacle over a hundred times. The Tab was a popular service for Wheaton undergraduates to attend on Sunday evenings, and many who saw and heard him preach there agreed that Graham’s style in later years remained much as the same as his student days. While perhaps a little less vocally and physically enthusiastic, the sermons Graham preached at the Tabernacle were not significantly different from the messages he preached before packed stadiums over the next several decades of evangelistic ministry. An advertisement for United Gospel Tabernacle services in The Record, the student newspaper of Wheaton College. August 19, 1942Graham’s reputation as a preacher continued to grow during his undergrad days, and he often arranged for guest speakers at the Tab when he accepted weekend preaching invitations across the Midwest and especially throughout the summer vacation. 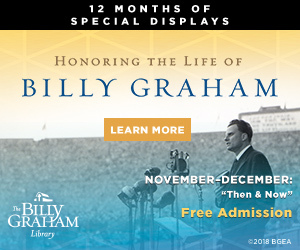 An advertisement from The Record, highlighting the end of the academic term and Billy Graham’s final weeks as the Tab’s pastor. Graham graduated from Wheaton the same month. June 1, 1943. 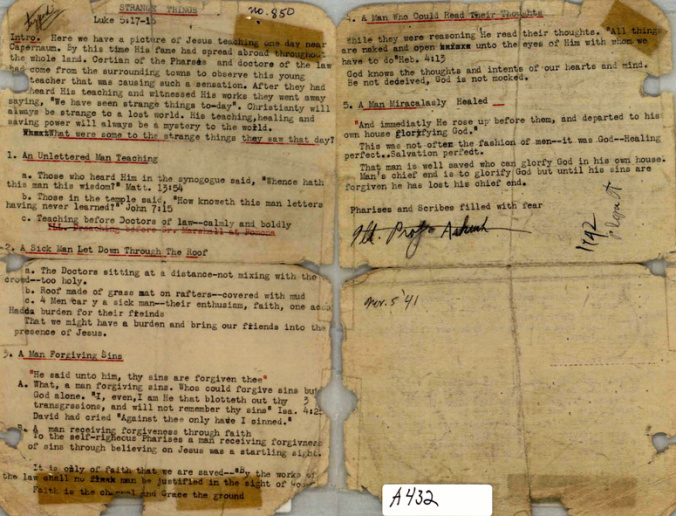 The BGC Archives holds thousands of sermons Graham preached over the course of his ministry, but only one from his days as the Tab’s pastor—”Strange Things” (Many records from the United Gospel Tabernacle were lost when the interior of the Masonic hall, including the church office, was gutted by fire in 1948). 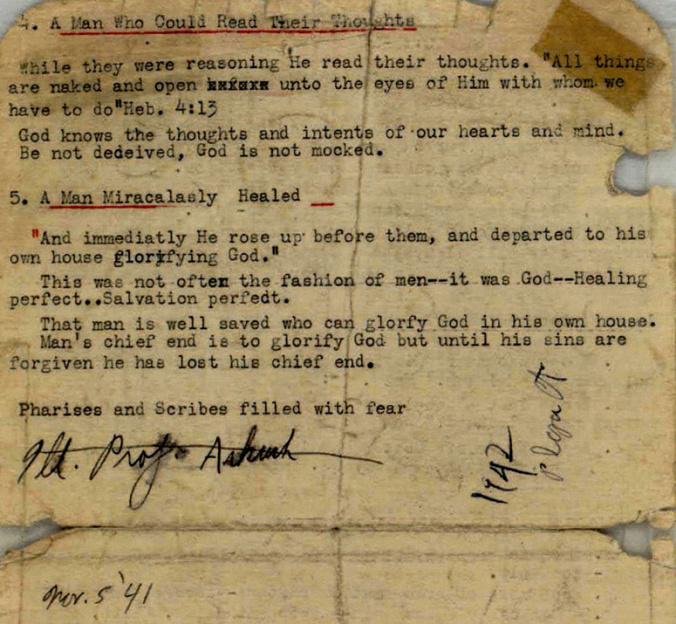 The typed outline below is annotated in what looks like Graham’s handwriting and dated November 5, 1941, only a few weeks after Graham became the pastor of the Tabernacle. November 5th was a Wednesday, so the message may be a Bible study Graham presented during the Wednesday evening prayer meeting, rather than a Sunday sermon. But it contains the same emphasis that his classmates remembered from his sermons—the power of Jesus to confound the world, forgive sins, and save souls. This original manuscript is much worn, possibly reused for multiple preaching occasions, clearly previously folded and held together by clear tape. The number 850 at the top of the first page was one assigned by the Billy Graham Evangelistic Association staff many years later, when they created an index of all Graham’s sermons. 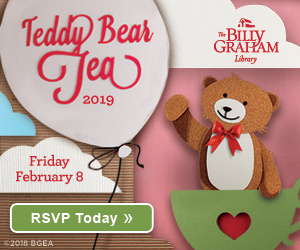 This article was originally published at From the Vault, a blog of the Billy Graham Center Archives at Wheaton College, on March 1, 2019. Fine Preacher. How can I get hold of an entire collection of his preachings? 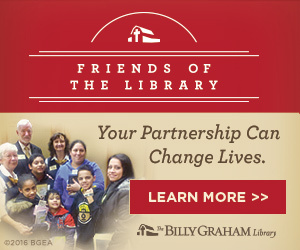 I love Billy’s stories thanks for posting.